Picture is kind of blurry, but it is some kind of Japanese maple. Looking at how thick the trunk is, I think it has been chopped off to keep it that short. 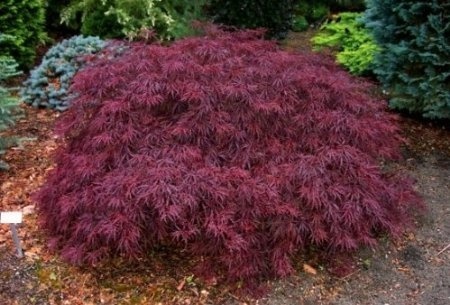 There are dwarf Japanese maples. there are many, many different varieties of JM's! I will tell you my experience with growing JM's. When I decided I wanted one, I looked around and found a mail order catalog that specialized in them. I splurged and paid $40 for one. When it arrived, it had a trunk about the thickness of a thread; it had fully leafed out and died, by the time it got to me. I contacted the company and they just said they don't guarantee anything and it must be my fault. Later I found a very nice little specimen at Kroger's grocery for $10. I bought it and planted it. It thrived and was beautiful. Ten years later or so, when I moved away, it was 6' high and wide and doing well. Don't buy one from a catalog unless they tell you the size of the tree you will be getting and guarantee it for at least a year. Some varieties of Japanese Maples grow well in containers even. My neighbor has 2 in containers and they are thriving! Just make sure that the pot is big enough and has drainage holes and potting soil mixed with tree soil. Good luck on that tree and have fun! rainbowgardener wrote: I will tell you my experience with growing JM's. When I decided I wanted one, I looked around and found a mail order catalog that specialized in them. I splurged and paid $40 for one. When it arrived, it had a trunk about the thickness of a thread; it had fully leafed out and died, by the time it got to me. I contacted the company and they just said they don't guarantee anything and it must be my fault. I don't even remember, it was many years ago. Some place that only sold Japanese Maples. If the catalog you get it from guarantees them, you will be fine.